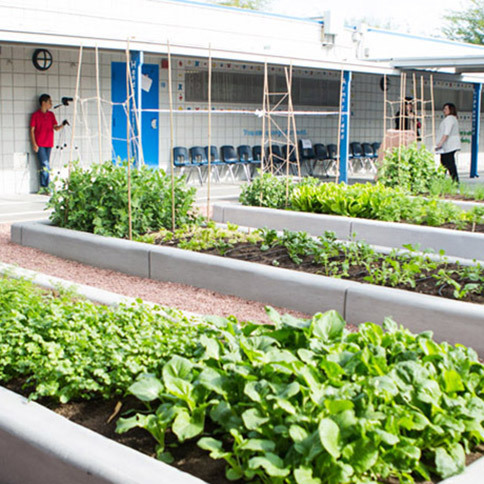 Earlier this year we launched a new website for Create a Change Now, a 501(c)3 nonprofit organization in Las Vegas, Nevada that teaches children about healthy eating through growing gardens in schools and other awesome programs. We really love the mission of this group and have been working with them for the last few years, so it’s neat to see their growth over the years as well as the new face of their website. The new site is clean, organized, and lets their beautiful mission really shine. The new website is run by WordPress, with a theme using the Genesis framework. We wanted the site to be really clean and user-friendly, and this theme does exactly that. Some great photos are featured throughout the site, showing happy kids participating in their activities, lush gardens, and great volunteers working hard. One of the big changes with this new site is the organization of all of the pages. We did a big overhaul on the page structure, adding a page that lists all the schools that Create a Change Now works with. 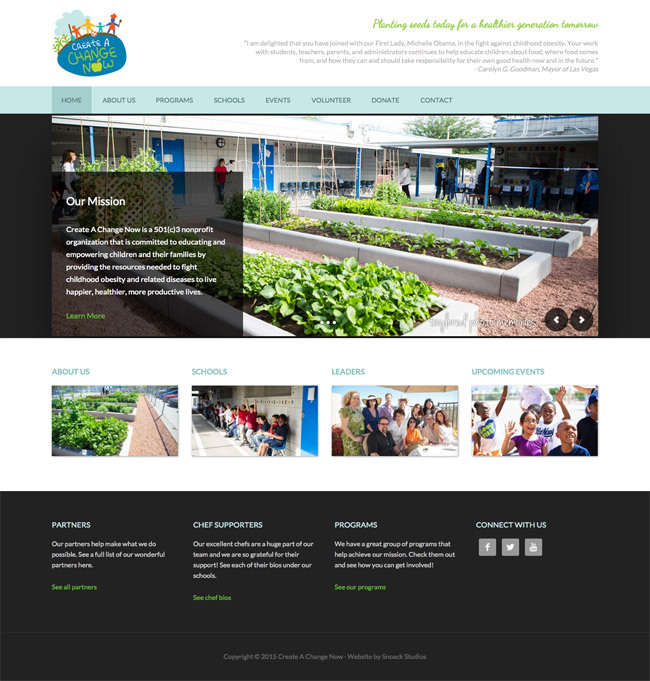 From there you can get to the individual school pages, where each school now has their own space that displays their address, pictures taken at their events, testimonials, chef supporters, and community partners. A lot of great things are going on at each school and it’s all contained on these school pages now. Another exciting addition is the custom donation form on the Donate page. It’s now very easy for people to donate (one time or monthly) to CACN right on their website. The form is created with Gravity Forms and the money is run through PayPal. We built another custom form on the Volunteer page giving new volunteers an easy way to submit their information, telling CACN what they are interested in helping with and when they can help. They also have a ton of photos on their Gallery page, and a great calendar that is continually updated with all of their Upcoming Events. Shannon with Snoack Studios has been supporting Create a Change Now for over 3 years. Her knowledge, professionalism, and dedication to our organization has truly helped us to take our website to the next level. As an Executive Director with a non-stopping busy schedule, having a website with crystal clear and informative information was imperative for our organization. As we shared our visions of change and goals, her efforts in execution and delivery were beyond impressive. With our organization being located in Las Vegas and her in Nebraska, this at first raised concern. Little did we know, she was beyond ready to take on the challenge and every time we have a task that needs to be implemented she SHINES beyond words with a quick turnaround time. We strongly recommend her to any professional that is looking for personalize, caring, knowledge and determination! Thank you Melissa! We’ve really enjoyed working with CACN as well, and look forward to seeing where the organization goes in the future! Check out the new website, we encourage you to think about participating or volunteering if you’re in the Las Vegas area, and let us know what you think of the new website in the comments below!